Happy holidays to all of our clients and collegues! We hope you all the very best holiday season and a happy New Year! EMLA will be closed until 1/4, but we look forward to seeing you all in 2016! A new deal for Carrie Clickard! There's a lot to celebrate this week, including a new deal for Carrie Clickard! Check out the announcement in Publishers Weekly below - doesn't it sound incredible? Look for it in Spring 2017! Congratulations, Carrie! Sylvie Frank at S&S's Paula Wiseman Books has bought an untitled picture book biography by Carrie Clickard (l.). The story, told in verse, is about a culinary icon who emigrated to the United States and changed the food landscape; debut artist Katy Wu will illustrate. Publication is scheduled for spring 2017; Tricia Lawrence at Erin Murphy Literary Agency represented the author and Jennifer Mattson at Andrea Brown Literary Agency represented the illustrator in the deal for world rights. A fourth star for THE LIGHTNING QUEEN! The Bulletin of the Center for Children's Books has given Laura Resau's THE LIGHTNING QUEEN its fourth starred review! "[T]his is a poignant, lovely work that weaves humor, heartbreak, and whimsy into a narrative spell that will surely capture readers' hearts." Huge congratulations, Laura - we couldn't agree more! Today is the day - Cat is back in business. Curious what he's up to now? 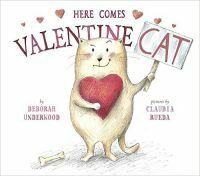 You can find out in Deborah Underwood's HERE COMES VALENTINE CAT, available today! Please join us in celebrating Deborah and her newest release! A starred review for the audiobook of A NIGHT DIVIDED! SLJ gave the audiobook of A NIGHT DIVIDED by Jennifer A. Nielsen a starred review! "This excellent work of historical fiction is suspenseful, realistic, and enthralling." Congratulations, Jennifer! 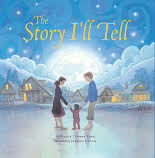 Nancy Tupper Ling's THE STORY I'LL TELL received another starred review! Booklist called it "a comforting resource to parents and children alike." Congratulations, Nancy! We couldn't be more thrilled for you. No, you are not experiencing deja vu: It's two Audrey Vernick book deal announcements in two consecutive weeks! Last week we mentioned that Audrey has twenty books published or under contract, and today we are pleased to share details about one of those, which we couldn't announce until an illustrator was secured. Those of you who know Audrey and her books know that she has a thing for baseball. Some of her most successful projects are picture book biographies of people associated with the sport. We're so pleased that her latest subject is Max Patkin, a professional ballplayer turned baseball clown (whom I personally remember from BULL DURHAM). 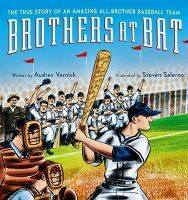 Audrey will publish this latest book, A CLOWN WALKED INTO A BALLPARK, with Jennifer Greene at Clarion, who also coached BROTHERS AT BAT and the forthcoming KID FROM DIAMOND STREET to publication (as well as many of Audrey's non-baseball-related books). Jennifer has signed up the wonderful Jenn Bower to illustrate, and her comedic touch should be perfect for this one! Huge congratulations once again, Audrey! Fish in a Tree - Eight weeks on the NYT Bestseller List! There Was an Old Dragon Who Swallowed a Knight - 2015-2016 Sunshine State Young Readers Award Jr.
New Shoes – Nominated for the 47th Annual NAACP Image Awards in the 'Oustanding Literary Work – Children' category. We're so thrilled that BUNNIES!!! has been aquired by Polish publisher, Wydawnictwo CzyTam, via Rights People. THAT'S NOT BUNNY! is a 2016 Junior Library Guild selection! Korean publisher Sang-Sang-Eui-Him Publishing Company has acquired the rights to BOOK SCAVENGER, THE UNBREAKABLE CODE, and an as-of-yet untitled third book in the series, thanks to Macmillan. The trilogy has also sold to German publisher Mixtvision. BOOK SCAVENGER is also a Junior Library Guild selection! MARVELOUS CORNELIUS will be available in Korea. Sanha Publishing has licensed the rights, via Chronicle. MARVELOUS CORNELIUS is also a 2015 Junior Library Guild selection! Italian publisher Antonio Vallardi Editore s.u.r.l. acquired the rights to THE REALISM CHALLENGE, via Random House. Scholastic has licensed AUDACITY for their April Teen Club! Ideal Audio Books has acquired the rights to all three books in the All Four Stars series - ALL FOUR STARS, THE STARS OF SUMMER, and STARS SO SWEET, via Penguin. ELENA VANISHING is a 2015 Junior Library Guild selection! Turkish rights to ON THE EDGE OF GONE have been sold to Yabanchi, via Rights People. Sub rights to I AM COW, HEAR ME MOO have been sold in Australia, New Zealand, Taiwan, Hong Kong, and Macao! German publisher Ravensberger has acquired the rights to publish NOT IN THE SCRIPT, via Bloomsbury. THE CHARMED CHILDREN OF ROOKSKILL CASTLE is a 2016 Junior Library Guild selection! YELLOW COPTER has been selected by the Scholastic Book Club, via Penguin. MOTHMAN'S CURSE is a 2015 Jutnior Library Guild selection! Beijing Yuanliu Classic Culture has licensed Chinese Simplified rights to FISH IN A TREE, via Nancy Paulsen Books. The Korean publisher Neungyule Education Inchas acquired HOW TO PUT YOUR PARENTS TO BED, via Rights People. We're thrilled that Japanese publisher Bunkeido Ltd has acquired the rights to WATCH OUT FOR FLYING KIDS, via Peachtree. Clavis Uitgeverij licensed Dutch rights to WHEREVER YOU GO and Slovakian publisher Verbarium s.ro.o. has acquired the rights to SOPHIE'S SQUASH. GROUNDED has been acquired by Italian publisher G. Feltrinelli Editore, via Rights People. We're so thrilled that A NIGHT DIVIDED by Jennifer A. Nielsen has been sold to Italian publisher Giunti Editore, via Scholastic. Scholastic has also acquired the audio rights for A NIGHT DIVIDED. Blackstone Audio has purchased the rights to an audiobook of WHERE FUTURES END, which will be released simultaneously with the hardcover in February 2016! HOW TO SHARE WITH A BEAR is a 2015 Junior Library Guild selection! Trent Reedy's THE LAST FULL MEASURE will be available in audio book in summer 2016 from Scholastic Audio. Scholastic acquired the audio rights to THE LIGHTNING QUEEN. Jeanne Ryan's NERVE is selling all over the place - Hungarian rights were bought by Gabo Kiado, Portuguese rights bought by Editorial Presença, Spanish Language rights by Penguin Random House, Serbian rights sold to Urban Reads, and UK/Australia rights were bought by Simon and Schuster UK! French publisher Editions Robert Laffont has aquired the rights to Jeanne Ryan's CHARISMA, via Dial. IN THE CANYON is a 2015 Junior Library Guild selection! Turkish publisher Pegasus Yayinlari has aquired the rights to publish DREAMSTRIDER, via Rights People. The Japanese publisher of MAYBELLE IN THE SOUP and MAYBELLE GOES TO TEA, Fukuikan, is back for the next two books, MAYBELLE AND THE HAUNTED CUPCAKE and MAYBELLE GOES TO SCHOO, via Macmillan. EPIC FAIRY TALE FAIL and MY SORT OF FAIRY TALE ENDING have both been licensed by the Scholastic Book Clubs, via Sourcebooks. EMMANUEL'S DREAM was selected as a FirstBook #StoriesForAll featured title! Rights to MY DOG IS THE BEST sold in Japan, via Macmillan. Scholastic Book Club has licensed INTERSTELLAR CINDERELLA. Korean rights have also been sold to Awesome World Co. Ltd. and Spanish paperback rights have been licensed by Scholastic, all via Chronicle. HERE COMES SANTA CAT is going to France! Editions Circonflexe has licensed the rights, via Dial. HERE COMES THE TOOTH FAIRY CAT is a 2015 Junior Library Guild selection! THE KID FROM DIAMOND STREET is a 2016 Junior Library Guild selection - what wonderful news! French publisher Editions du Genevrier has acquired the rights to publish FIRST GRADE DROPOUT, via Rights People. FIRST GRADE DROPOUT is also a 2015 Junior Library Guild selection! Walker UK has acquired the rights to all three books in the The City of Secret Rivers series, thanks to the Rights People team. We at EMLA would like to thank all of the sub rights teams involved and our own co-agency, Rights People, for all of their continued effort and support. 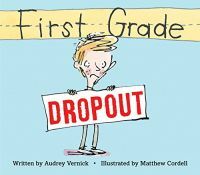 Audrey Vernick's FIRST-GRADE DROPOUT, illustrated by the wonderful Matthew Cordell, has gotten some truly lovely attention, including a super-glowy review from The Boston Globe, which called it "a just right book," and lots of love from teachers. So it's no surprise that the protagonist will be promoted to second grade in SECOND GRADE HOLDOUT--or will he? He wanted to quit school altogether in the first book, thanks to an Embarrassing Incident. Now he's not sure he wants to leave the first grade. SECOND GRADE HOLDOUT was just signed by Jennifer Greene, fantastic editor at Clarion, and is scheduled to release in fall 2017. Audrey's contracted and published books now total TWENTY. Huge congratulations, Audrey!